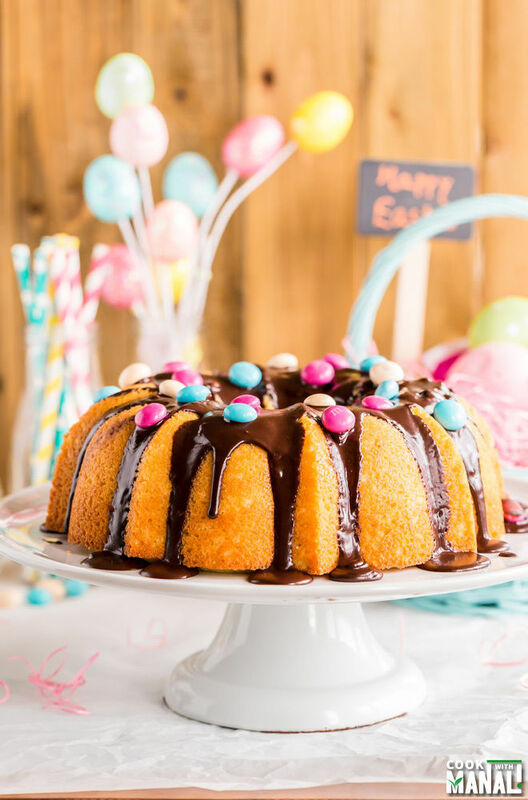 Lemon Bundt Cake drizzled with an easy Chocolate Glaze and topped with M&M’s® Easter Sundae is a great dessert for your Easter table! What do you guys think about the daylight savings? Annoying? Required? I absolutely hate losing an hour in the spring but obviously love the extra hour we get back later in the year. The thing is that I do not understand this whole concept of day light savings. We don’t have it in India but the first time I faced this was in Scotland. I remember I was so confused that I ended up missing my morning lecture because of all the confusion. By the time I reached the bus stop the bus had already left because apparently I was an hour late whereas my clock obviously showed the same time as yesterday! Why do they do it? What’s the point? Maybe it’s just me, but I don’t really get it. I know it’s only an hour but it still bothers me. I feel like I need 2 extra cups of chai to get through this and ever since the clock went ahead this Sunday, I have been really struggling. But daylight savings or not, what can get me through any day is, yes you guessed it – a cake! 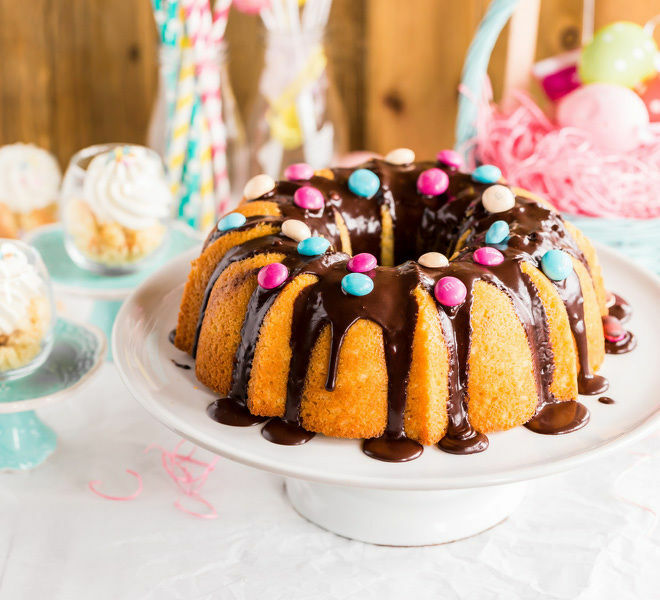 And not just any cake, this Lemon Bundt Cake drizzled with a super easy chocolate glaze and topped with M&M’s® Easter Sundae can actually cheer me up any-day and anytime of the year. So what if it’s cold and raining in Seattle? I will just look at this cake and pretend that it’s spring! I have always loved lemon desserts. Whether it’s in form of a cake, pie, macaron, cheesecake or anything else, if there’s lemon involved I want it in my plate. I think the tangy lemon flavors really helps in balancing the flavors and that’s what makes lemon desserts so delicious. Since Easter is just around the corner, I thought of sharing a simple dessert with you guys, which would look great on your Easter table. Actually hubby loves lemon desserts too so I am going to bake this cake for him on Easter! 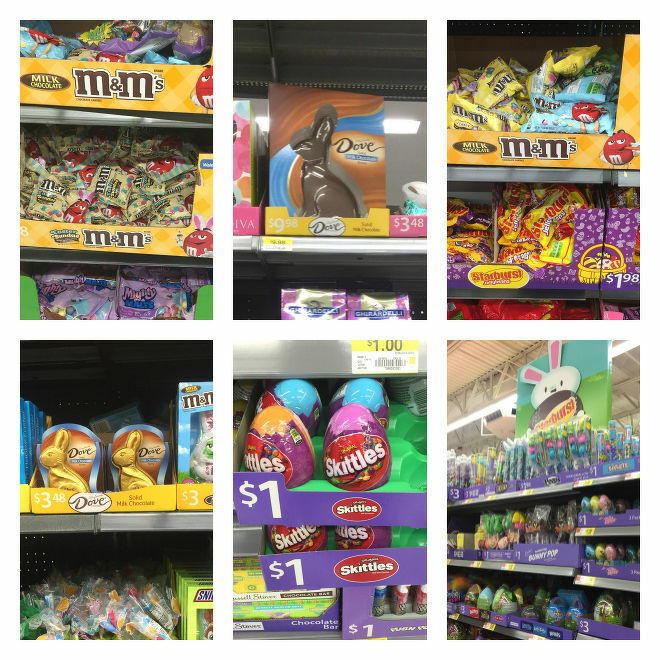 You guys know how much I love my desserts so to decorate my Easter table and basket I headed to Walmart over the weekend where I could find all sorts of Easter candies. I picked M&M’s® Easter Sundae which are actually being sold for a limited time and exclusively at Walmart. So don’t forget to get them before they are gone! I also picked Starburst® Original Jellybeans, Easter M&M’s® Milk Chocolate, DOVE® Milk Chocolate Easter Bunny, Skittles® Egg, DOVE® Solid Milk Chocolate Bunny, Hubba Bubba® Bubble Tape, Skittles® tube and Easter Mixed Brand Chocolates. I used M&M’s® Easter Sundae on top of my cake and used rest of the products to decorate my Easter basket and table! 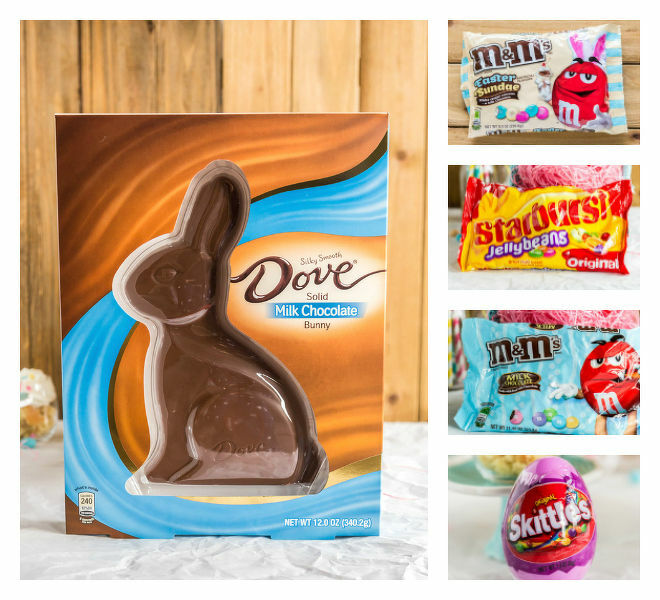 Click HERE for more creative recipes and inspiration for your Easter Basket! This lemon bundt cake comes together really quickly. I used lemon extract, lemon juice and lemon zest to get the real lemon flavor. 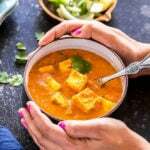 Here I would like to mention that please use fresh lemon juice in this recipe. The bottled lemon juice cannot really match up to the fresh zest and juice. I always think that Bundt Cakes are showstopper desserts. They are so pretty on their own , you don’t really need to do much except maybe add a chocolate glaze and some M&M’s® on top! ? In a bowl whisk together flour, baking powder and baking soda. Set aside. Using the paddle attachment of your stand mixer or using your hand mixer, beat together butter and sugar till well combined. Add eggs, one at a time and beat till well combined. Next add vanilla extract, lemon extract, lemon juice and lemon zest and mix till combined. Start adding the flour mixture into the wet ingredients. Add the flour in 3 parts alternating with milk and starting and ending with the flour mix. Do not over-mix the batter once the ingredients have combined. Transfer batter to a greased 12 cup bundt pan. Bake at 350 F degrees for 45-50 minutes or till a toothpick inserted in the center comes out clean. Remove cake from oven and let it sit in the pan for 10 minutes. After 10 minutes, invert it on a serving plate. Make the chocolate glaze by mixing together powdered sugar and cocoa powder. Add milk and vanilla extract to form a smooth glaze. Add butter and place the bowl on top of a double boiler till butter melts. 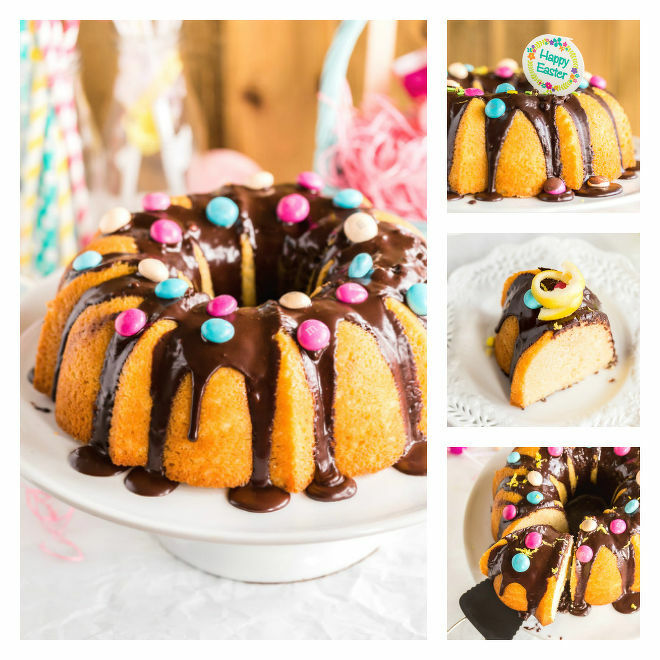 Pour the chocolate glaze on top of the lemon cake and decorate with M&M’s® Easter Sundae. * I used salted butter in this recipe and this is a personal preference. Feel free to use unsalted butter but in that case, do add little bit of salt to your flour-mix. * Bundt cakes can get stuck in the pan. My biggest advice will be to grease the pan like crazy! Like go all out, spray with non-stick spray to your heart’s content! Once the cake is baked, take it out of the oven, let it sit for 10 minutes and then invert it on your serving dish. If the pan was greased well, the cake would come out easily. And even if some pieces do not come out, that is fine, you can always cover them with the glaze. 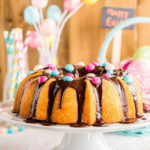 I found all the products for this recipe and for my Easter basket/table at my local Walmart! 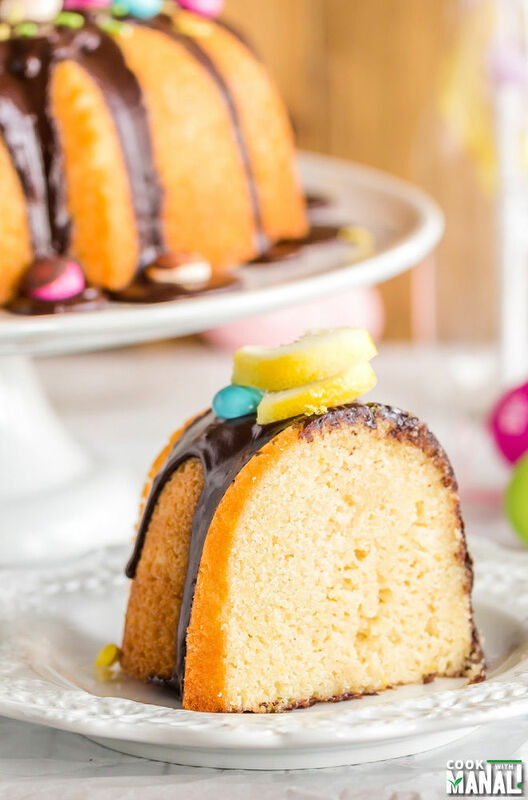 Lemon Bundt Cake with a super easy Chocolate Glaze is the perfect dessert for Easter! 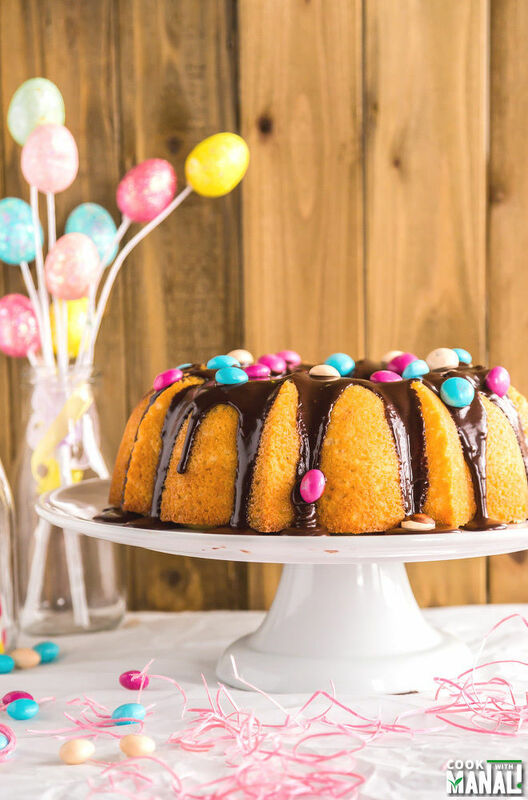 Pour the chocolate glaze on top of the lemon cake and decorate with M&M's® Easter Sundae. Great combination! Love the combination of lemon and chocolate. I am VERY anti the time change. Like, it’s stupid. We can live with an extra hour of dark for, like, a month. It’s SO not a big deal! But this cake is making me very happy. It’s beautiful! I love lemon, too. 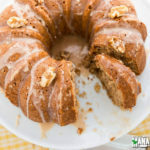 Makes the best bundt! 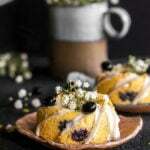 This is such a beautiful Spring dessert and I bet it would be very well received if it was served up after Easter dinner. You make the prettiest Easter desserts! 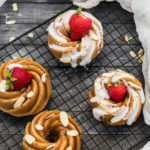 This bundt cake is absolutely gorgeous! And I’ve got to find those M&Ms…sounds just perfect with this festive dessert! How colourful and delicious! 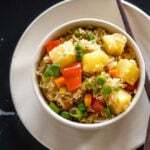 Bet it tastes just as amazing as it looks, Manali. What a gorgeous cake, Manali! 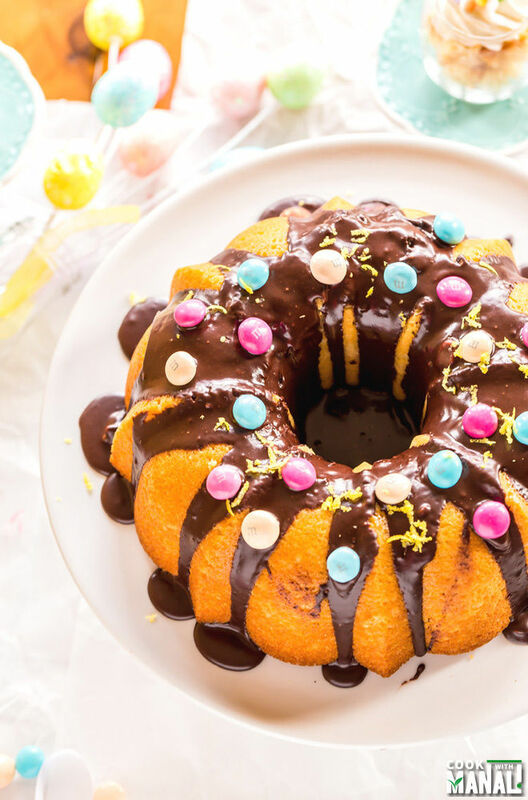 Love the colorful candies and the fact that the bundt cake is lemon! LOVE lemon cake! Can’t wait to try…it’ll be perfect for Easter! That is true! Thanks Rahul! We have been struggling with the time change too..especially the kiddos but I know this cake would definitely cheer everyone up! 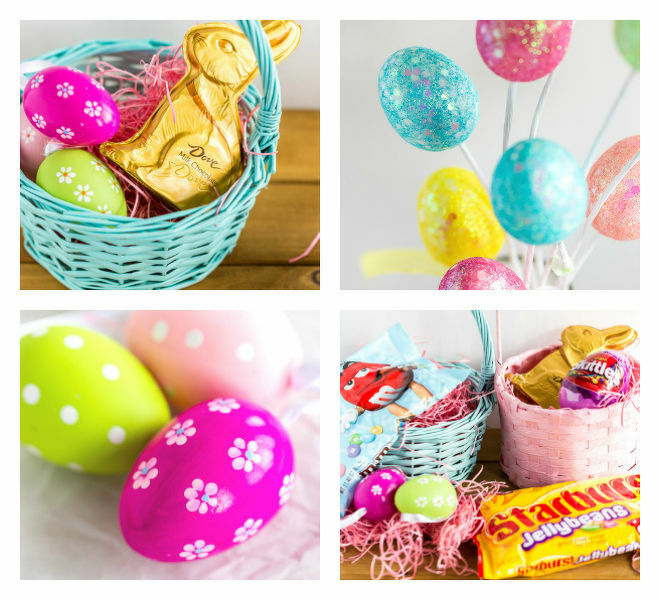 It’s so festive and pretty – perfect for Easter! 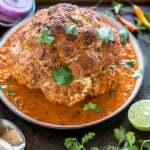 I am in love with the recipe. Cakes looks gorgeous dear! Whoa! I love M&M’s and lemon! This would definitely get me out of the bed after this dang time change! Lemon, chocolate, and M&M’s! I’m all in!!! What a fun way to celebrate Easter! IT sure is! Thanks Kathy! I hate it too but we don’t have a choice! This cake is seriously drool worthy! Love the chocolate lemon flavor combination! And it’s beautiful! The time change is a drag. I’m still an hour behind, ha! Hopefully we can all get adjusted soon!! Thank you Jen! I hate the time change..grrr! 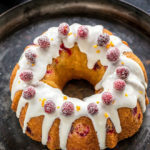 Bundt cake looks stunning…I too love lemon flavoured desserts!! Perfect easter treat!! Hey, it looks delicious. 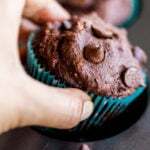 Can I use whole wheat flour instead of all purpose flour?! you may Swetha.. the texture won’t be the same though..
Ok, will try and update. Thanks!